Get these rainbow fans just in time for a rainbow themed party for kids or a pride event for adults! Pack of 6 at a value price means you get extra to hand out to friends! Include these fans as part of a goody bag or treat bag, or hand them out in the spirit of pride events. Each hand fan only weighs .11 lbs, meaning that you can carry these around all day without getting tired. The plastic build is significantly more durable than those of paper fans. 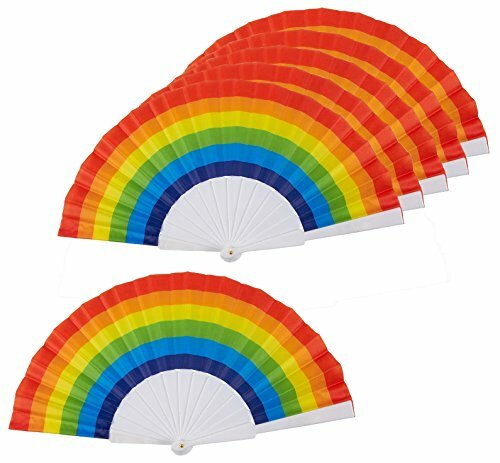 RAINBOW FOLDING FANS: Includes 6 plastic rainbow hand fans. SUITABLE FOR A WIDE VARIETY OF EVENTS: Use these rainbow fans in rainbow-themed birthday parties, rainbow unicorn birthday parties, gay pride events, gay weddings or just as everyday household decorations. VALUE PACK: Get 6 rainbow fans at a value price! Large pack size is perfect for handing out at events or parties. LIGHTWEIGHT: Each fan only weighs .11 lbs. Light weight allows for carrying all day without fatigue. DIMENSIONS: Measures 9.25 x 1.25 x 0.75 inches when folded, 15.7 x 9 inches when open.